Audrey Chan, Proposal for a Mural Dedicated to David Tran, 2013, gouache on paper, 20 x 28". When the Chinese American Museum developed an exhibition inspired by two locally made hot sauces, there was no doubt that some found the show’s premise a dubious proposition at best, anticipating flippant treatments of food and multiculturalism. The result is anything but; “LA Heat” embodies a sophisticated, playful, and complex view of culture, specifically positing the cultural coalescences and convergences that happen despite subtle but impactful stereotypes that presume (and precede) separation and difference. The sauces at the center of all this are Sriracha and Tapatío, two businesses founded and grown by immigrants to Los Angeles in recent decades. The thirty Los Angeles–based artists included drew inspiration as much from the condiments themselves as from their layered histories. Sriracha, for example, was created by a Vietnamese immigrant from China and is derived from a Thai recipe, while Tapatío, the brainchild of an immigrant from Mexico, first sold in a Japanese grocery store. The diversity of media represented—painting and sculpture, video and animation, street art and illustration—adds another layer, subtly critiquing boundaries established in art alongside those constructed around race and ethnicity within society at large. Slick translates a bottle of hot sauce as a spray can with a gas mask, while Sket One transforms it into a fire extinguisher, highlighting presumptions that tie street art and vandalism. Paintings by Phung Huynh and Sandra Low confront assumptions about cute Asian children, specifically girls, empowering their subjects while pointing to darker influences. Huynh’s teary-eyed teens meet viewers’ gaze head-on with raw emotion, while the Girl Scout in Low’s work packs a punch as bottles of hot sauce are strapped to her chest like ammunition. Audrey Chan’s proposal for a mural poses the immigrant success stories prevalent in community art in contrast with the reality of global-political discrimination and violence. 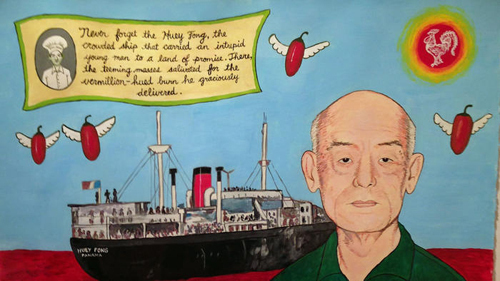 Sriracha’s founder, David Tran, is depicted alongside a freighter carrying refugees across a blood-red sea.